October Quotes i.e. searching for some funny and cute quotes about month of October. If yes, now you don't need to search for them anymore. As here I have compiled down some of the best October quotes and sayings for you. Just hope you will like the quote compilation and welcome this month of October by sharing some of quotes from here. Welcome October, please be sweet! Keep Calm and Say Hello to October. October, here's to you. Here's to the heady aroma of the frost-kissed apples, the wine-y spell of ripened grapes, the wild-as-the-wind smell of hickory nuts and the nostalgic whiff of that first wood smoke. 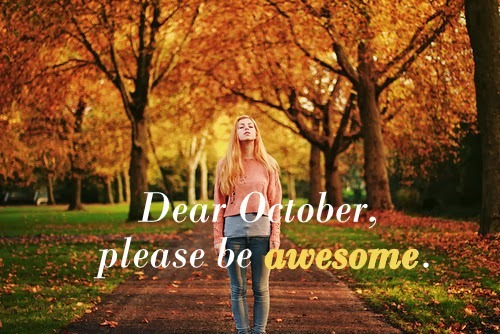 Dear October, Please be awesome! October turned by maple's leaves to gold; The most are gone now; here and there one lingers; Soon these will slip from the twig's weak hold, Like coins between a dying miser's fingers. Hello October! Please be good to me. Under the harvest moon, When the soft silver Drips shimmering Over the garden nights, Death, the gray mocker, Comes and whispers to you As a beautiful friend Who remembers. The to gather nuts is pleasant. The sweet calm sunshine of October, now Warms the low spot; upon its grassy mould The purple oak-leaf falls; the birchen bough Drops its bright spoil like arrow-heads of gold. Keep Calm and Welcome October. Keep Calm and It's October. Hello October! Please be nice. Let's spark up October and make it better than September.